Frozen exerts its magical powers on audience’s hearts. Like Tangled and Brave, Frozen begins in the past, with the major characters as very young children. First we follow a little boy, Kristoff, and his adorable baby reindeer, Sven. We then meet very young Princess Elsa and even younger Princess Anna. Elsa and Anna are not only sisters, they are best friends. Elsa has wonderful magical powers that captivate her doting baby sister. But Elsa’s powers can also be dangerous. To protect Elsa and all those around her, her parents, the King and Queen of Arendelle, make the decision to lock the castle off from the public and to secure Elsa in her castle room, where she grows up in isolation. Young Anna is left to wander an empty castle, yearning for her lost sister. Many years later, the castle doors are reopened, and Elsa and Anna, now young women, are finally allowed to meet the public. 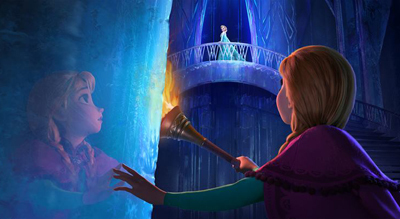 Anna is delighted, while Elsa is filled with dread: what if her terrible secret is revealed? Sparks fly, setting off a chain of events that ends with the entire kingdom of Arendelle blanketed in eternal winter and the only person who seems to have the power to end this curse living far away in a castle of ice. Plucky Princess Anna sets off into the dangerous snowy Scandinavian wilderness to find her sister and to try to set things right. Along the way, she is joined by now-grown-up Kristoff and reindeer Sven, and later, by a talking snowman named Olaf. Frozen is a big-screen visual treat, especially when Elsa wields her powers. But the movie takes off when the characters start singing. Frozen's casting director, Jamie Sparer Roberts, smartly cast actors who were also singers: like Idina Menzel in the role of Elsa and Kristen Bell as Anna. The songs, written by Kristen Anderson-Lopez and Robert Lopez, especially Anna and Elsa’s duet “For the First Time in Forever" and Elsa’s “Let it Go," swept me away, making me feel at times like I was watching a Broadway show rather than an animated movie. The story, by Chris Buck and Jennifer Lee (the pair also direct the film) along with Shane Morris, loosely inspired by Hans Christian Andersen's The Snow Queen, is engaging, with some nice romance thrown in. There is even a huge twist; my jaw literally dropped in surprise. The movie should appeal to Disney's usual girl demographic and little boys will no doubt enjoy Kristoff, reindeer Sven, and Olaf the snowman. Parents looking for a date-night that doesn’t require a babysitter should consider joining their kids at the movie theater. 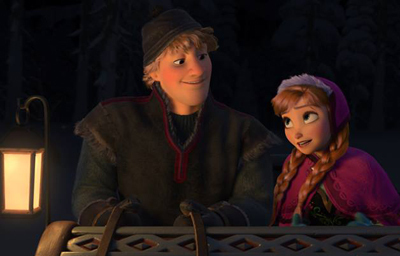 Frozen is perhaps one of the few great date-night movies that can be enjoyed by the whole family. Both Frozen's songs and story were vaguely reminiscent of Broadway’s Wicked. Musical theater fans, even those without children in tow, will want to check it out; Menzel once played the role of Elphaba on Broadway, and so this movie will probably be on most musical theater aficionados’ radar. And it should be, this movie is musical (and Disney) gold. Frozen opens in theaters November 27, 2013. * Jen attended a complimentary screening of Frozen. Find more of Jen's movie reviews here.